The Maulus Navy Issue trades the Remote Sensor Dampener bonuses from the Maulus for the drone bonuses from the Tristan and adds an extensive boost to Warp Scrambler range and strength. The Navy Issue version of the Maulus can, like the Tristan, field a full flight of light drones and has the capacity in the drone bay for a total of ten light drones. As with the Tristan, you should focus on training drone skills to be effective with the Maulus Navy Issue. Train Drones V in order to field 5 drones and train Light Drone Operation V so that you can field the Tech II light drones. Add Drone Interfacing IV to increase the damage of your drones, Drone Avionics V to increase your drone control range, and Drone Durability IV to further increase drone hitpoints. 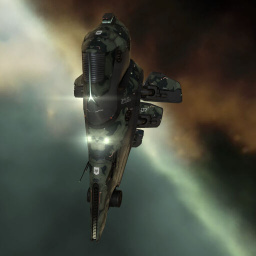 A Racial Drone Specialisation such as Gallente Drone Specialization III is highly recommended - III is a very short train. Consider Gallente first as their heavy damage can end fights quickly, but also Minmatar as Warrior II drones are best against very fast targets, but have lighter damage. You want to further increase the damage of your drones using weapon upgrades in the low-slots, if possible. The Tech 1 Drone Damage Amplifier I (T1 DDA) module requires Weapon Upgrades I and Drones I, and both to IV for the Tech 2 DDA. You can change the order in which you train these skills, however T2 Drones and Drone Damage Amplifiers (Weapon Upgrades IV) are significantly better than their T1 counterparts, and both carry no fitting overhead. Secondly, should you be kite fitting as recommended, you will want navigation bonuses. These include the basic Navigation IV which provides a flat boost to speed on grid, a propulsion module (ie High Speed Maneuvering III for MWD), and Acceleration Control III to improve the module, and Evasive Maneuvering III to be able to turn away from the opponent. Other valuable skills are Propulsion Jamming II to be able to use the longer range of the Warp Scrambler II, and either Shield Upgrades IV for a Tech II shield tank, or Hull Upgrades V for a Tech II armor tank, both of which are (as with drones) significantly better than the Tech I versions. Skills used typically on the Maulus (such as Frequency Modulation ) are not as necessary on the Maulus Navy Issue as the ship has no bonuses to electronic warfare. However, if you have been flying the Maulus previously and have Electronic Warfare IV, consider training Advanced Drone Avionics I to field a flight of Caldari Hornet EC-300 electronic warfare drones (this presumes you have already trained in to Drones V as well). As mentioned above, the Maulus Navy Issue is most often compared to the Tristan and can be thought of as a sort of "Super Tristan." Trading a high slot (which Kiting versions of the Tristan seldom used) for an additional low slot adds some additional options, as a Maulus Navy Issue could fit a speed modification, an Ancillary Armor Repairer, or something like that. The Maulus Navy Issue does not have the speed of the standard Maulus but is no worse than the Tristan so many of the same kiting tactics that apply to the Tristan are also applicable to the Maulus Navy Issue. However, do not overlook the other major bonus of the Maulus Navy Issue: the bonus to both Warp Scrambler optimal range and strength. With a Warp Scrambler II fitted and Gallente Frigate V the Maulus Navy Issue has an optimal scram range of 13km without overheating, which can serve as quite a shock to that Dramiel pilot who may have wandered too close to you. This makes the Maulus Navy Issue much more potent against those ships who wish to kite you than the Tristan. Note that this ability is restricted to a Warp Scrambler, so it makes little sense to equip this ship with a Warp Disruptor. The extra strength of the Warp Scrambler can be used to tackle targets that have additional Warp Core Stabilizers or who posses built-in warp core stabilization. This ability also gives the Maulus Navy Issue an additional role in fleets. But have care as the Maulus Navy Issue is still not an Ares: even with a Microwarp Drive the average Maulus Navy Issue pilot will still likely be about 750 km - 1000 km per second slower than an Interceptor (and indeed that is if the Maulus Navy Issue is fitted for speed and not damage or tank). Still, in a fleet role the ability to scram a target at such ranges is very helpful against faster targets, and can serve as a counter to different Kiting doctrines. This page was last modified on 6 May 2018, at 13:43.